Learn how to use Nimble's search functions to organize and clean up your Twitter contacts. The best way to set your CRM experience up for success is to organize your contacts. When you first start your Nimble account, you likely imported various data sources and social networks. 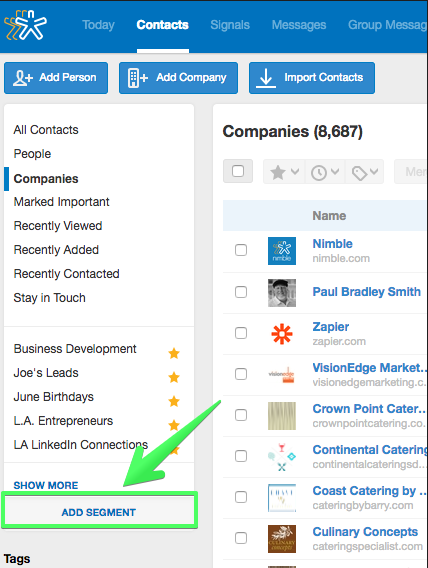 The volume of contacts can look intimidating at first, but if you use Nimble's search, you'll be able to easily organize your contacts. While Facebook has a designator for business pages, Twitter treats all profiles as one. 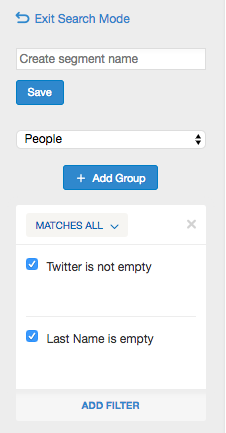 This means that when you import contacts to Nimble over the Twitter API, they will all appear as "People". Sometimes, this can result in having some companies or brands that appear as "People". I'm going to show a simple way to cull these contacts after your import. Step 1. Select "Add Segment" on the Contacts tab. "Twitter profile" is not empty. Step 3. Once this list is visible, verify that you want to delete the contacts, and complete the action.